What is the differences between Backup and Replication? - Details of an answer | Buffalo Inc.
What is the differences between Backup and Replication? The Backup and the Replication are different. Use the one that suits your purposes better. We use 2 TeraStaion with same models in both cases and see the difference. The Replication is using 2 TeraStation and synchronizing shared folders of those 2 TeraStation. I Data will be sent from the computer to the first TeraStation. II Data(each updated file) will be sent from the first TeraStaion to the second TeraStaion. * Replication source will be sent to Replication target every time the source file is updated. The Backup is copying the data from the backup source to the backup target according to the schedule set on the TeraStation. II The backup source will be copied to the backup target according to the schedule set on the TeraStaion. 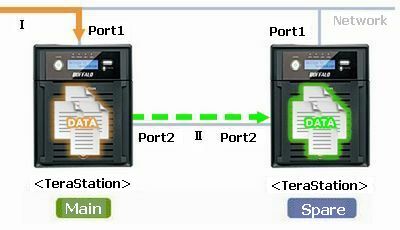 * This is the example of using 2 TeraStation. See the difference and use the one that suits your purposes better. 1 Restoration time Hardware When all the data are targeted for Replicantion, it can be restored by just modifying settings. When all the data are targeted for Buckup, it can be restored by just modifying settings. 2 Data You have an almost instant snapshot of the latest data before the failure. *1 The data will be the last data copied from the backup source according the backup schedule. *2 You can restore data from the last backup target data. 4 Transfer time from the computer to the first TeraStation It can be longer depending on the Replication settings Buckup settings don’t effect the transfer time from the computer to the first TeraStation. 5 Backup time No backup time when the Replication setting is on It can be long depending on the volume of data, so it is better to do backup not during the work time. 6 When to use When you want the latest data before the failure. When you don’t want long restoration time. When the volume of data is large. When you want to keep the history of data. *1 Replication will start every time the updated data is sent from the computer to the first TeraStaion. 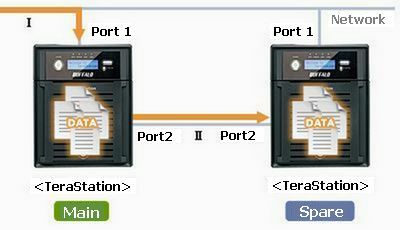 When there is a problem with the first TeraStation , updated data can be lost if the data transfer from the first TeraStation to the second TeraStation is not finished. *2 Replication is different from backup. You need a backup to prevent a file loss by mishandling.